For the first card, I’m featuring the newest Streetlights Die-namics. To create the background, I used the FABULOUS English Brick Wall stencil (another favorite) that I sponged with MFT dye inks: In the Buff, Natural, Hot Fudge and Orange Fizz. The happy day sentiment is from the Label Marker Sentiments set. For the second card, I sponged the background with MFT dye inks (Daffodil, Orange Fizz). Then I sponged again orange over the Grid stencil. The sentiment is from the new Thanks so very much set and the view of London is a die-cut from the London Skyline Die-namics. Both are fantastic, but I'm especially loving the first one! I love your cards and I appreciate you giving me the color names and directions. The London skyline brings me back to my trip to London. LOVE this. Great cards. Your coloring is fantastic. Love what you did with the stencils. So stunning both of these! The streetlights in front of the wall are charming. Thanks for sharing your talents. Amazing cards! These make awesome masculine cards...which I always have trouble coming up with. Thanks for the inspiration. how perfectly simple that first card is and yet it says so much. I love the shading you did on that. Your cards are great! I really like the streetlamp card. I did not see my comment, so I will try again. I like your cards, they are both great! I really like the streetlamp one. love the Streetlight and English Brickwall!! Really love the lamp post card. So elegant! Great cards! I really like the stencil on the first card. OMGosh I cannot wait to get the lamp! I love those words and they will be on my wish list for sure. Fabulous sky line! Love the colors and the great design....I had to buy them all! Love those backgrounds you chose! I so hope they do a Seattle skyline soon. Keep the trip around the world going!!! That skyline is amazing. Love it! Love the sponged backgrounds! Especially the first one... so mystic. Stunning cards. I love the way you have used the stencils in backgrounds. The soft misty effect on the brick wall and the bright and bold background of the skyline. I love the colors on the brick background. Stunning. Sunset over the London skyline is just so eye catching. The colors are gorgeous. Awesome cards! I love the CAS look, but realize that the cards were not so simple to make as a lot of effort truly went in to blending the colors to get the backgrounds just right. 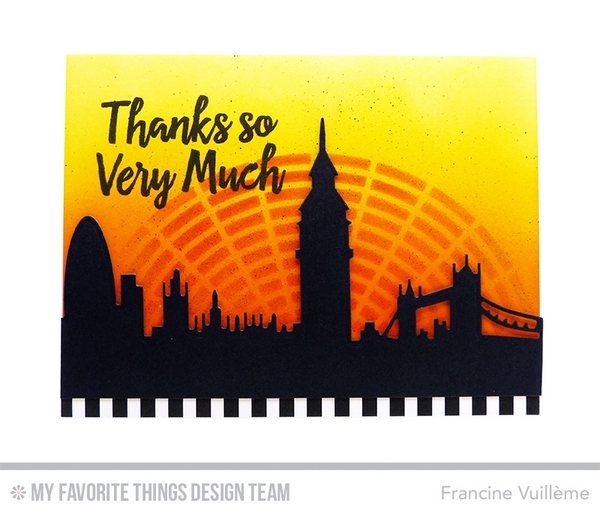 Awesome as Always Francine I love the first card it sure gives the spirit of London love that background and your second card wow that background and that skyline a perfect match. TFS. I have enjoyed seeing all your cards. Thanks for the inspiration Francine! I have enjoyed seeing your cards this week. Thank you! Your brick wall is awesome. Your cards look wonderful, love the sponged backgrounds. Love Love Love the look of that Brick Wall. I have to get that stencil. Great job on your cards! Beautiful cards! Love the brick wall with the lamp light!! Stencils are just fabulous for backgrounds....love the look. Francine, great job sponging on the colors. I just love the yellow and orange skyline! Gorgeous cards. The backgrounds are stunning. Love how you sponged the brick. Great cards with these amazing backgrounds! I esp. love the ambience created by the first card. Very nice! Beautiful cards, I love your use of the stencils!! 2 lovely card the colors are fabulous ! both cards are amazing, specially your first card is so romantic! WOW! these cards are stunning! What awesome cards Francine, I love how you used the stencils. I have enjoyed all your cards this week. Fabulous cards! Love the way you have used the stencils! Both cards are fabulous, just love the skyline Die-namics! I love the brick with the street lamp. Love the simplicity of the street light card, and the skyline card is fabulous! LOVE the beautiful London skyline! A very bright and pretty card! So bold! Love these Clean And Simple cards! Great backgrounds on both cards! 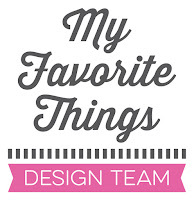 Super designs! Love how you've used just a portion of the stencil in the top card...great look! Boldness of the second is awesome, also!!! Beautiful cards using these dies. Beautiful cards! I love these skyline dies and the lamp post. Beautiful! Love the sponging on the 2nd card! Fabulous cards! Je les aime beaucoup! Fun cards. I love the London skyline. The street lights and the skyline, paired with the backgrounds you've created are amazing! 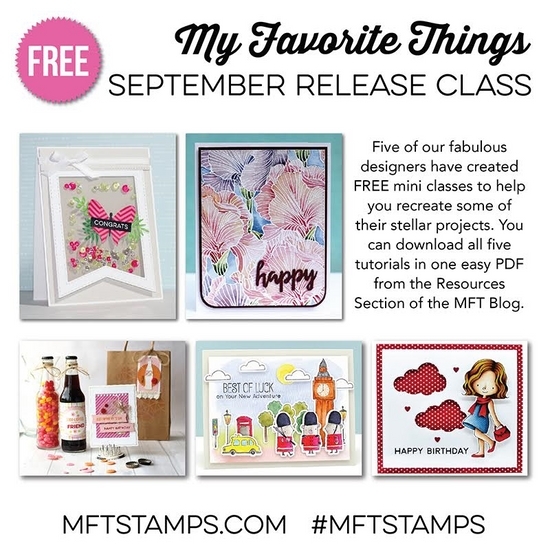 Such a fabulous showcase of the new release. I've gone straight from wish list to wish novel! Love your cards and those great backgrounds. Wow.. Both awesome cards! Love the lamp post again the brick wall! Wonderful inking on both of these! So glad you used the lamp post. Love it! I love both of the backgrounds and the lamp posts! Wonderful, I lvoe the lamp post! Love the beautiful and bold colors. I love that sponged brick wall! It looks so cool with the black silhouette. I like both cards. The lamp post feels so friendly and the colors of the NYC card are very appealing. Both of the card have wonderful colors and are each very different. Both cards are super! I really like the simplicity and neutral look of the lamp post card. Great cards--love the gorgeous colors for the 2nd one! Wow! Super amazing cards. I love your background - they are so cool! Both cards are FABULOUS!! 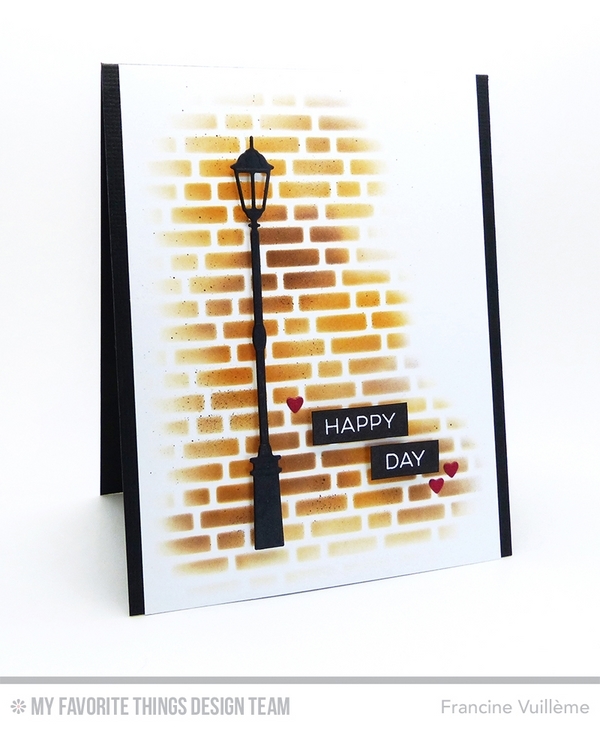 I love the lamppost die; it's so elegant and the brick wall is super fun. Love how the skyline was showcased, with the orange hues. I totally need that stencil. I knew I wanted it before I saw your card, but now I NEED it, lol!!!! Awesome inky background! Makes a really great sun set! I love your lamp post card! It is perfect! I love your lamp post card it is perfect! I love the lamp post card! It is beautiful! Wow, your cards are stunning. Pretty cards! The colors are so vibrant! lovely cards, i am loving all the skylines, love the backgrounds. Great ink blending for the brick wall! Really loving all the different backgrounds all you designers are creating to go with the skylines! Amazing! Love the lamppost card. Can hardly wait to get my lampposts in the mail. The order is in. Fantastic cards! Love the grading efect! Great cards ! Great release! Love the use of the stencils & lam post! The backgrounds on both of these cards are AMAZING and so well done and they help set the scene for these breathtakingly cool cards! !